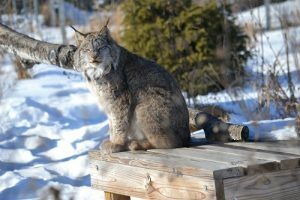 TWS received several calls from a man who was upset that Ramsey, a Canada lynx, was ruining his furniture and condo. He admitted he bought him off the internet and thought he’d make a great pet, but soon discovered that wild cats can be very destructive. He wanted us to come up with a solution for Ramsey’s aggression towards visitors and constant urination. We offered to take him in several times, if the owner would provide and/or pay for transportation. But the owner knew he had him illegally and believed he may get prosecuted at the airport. He said he was going to falsify the airline bill to say Ramsey was a domestic cat. Eventually, he took the risk and sent Ramsey to TWS. The owner also agreed to donate to his cat’s care. But as so often happens, The Wildcat Sanctuary has never received a donation towards Ramsey’s care from him. A concerned family member made a small donation to help care for Ramsey, which was very nice and very much appreciated. However, the owner still has not. Ramsey’s owner also set up a YouTube page where you can view a video of a person taunting Ramsey in his home. The page has had so many hits, it makes a profit. We referred to this video in our own video about the truth about wild animals kept as pets. Ramsey’s owner had it pulled claiming copyright infringement, even though he claims he never filmed the video. He now has a company called Ramsey, Inc. 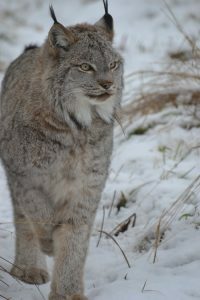 The good news is Ramsey has been living a wonderful life since the day he arrived at The Wildcat Sanctuary! He has the freedom to be a lynx now. Ramsey loves sitting on his platforms, watching his nearby bobcat and lynx neighbors, and huffing at his caretakers if they take too long to feed him. He knows when dinner is, and they better not be late! Would you consider becoming a sponsor parent for Ramsey? It’s easy and would mean so much! Sponsorships available here.